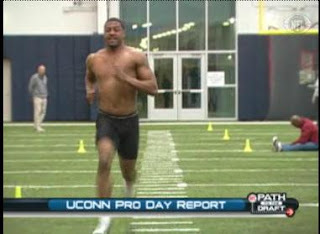 The 2009 UConn Pro day was held yesterday at “The Shenk” training facility. Workouts were, in a word: OUTSTANDING. Darius Butler again proved that he can move his hips, and has the kind of speed that can kill. Will Beatty, performing well in the bench, makes him a discussion topic, as he might be one of the top 5 offensive linemen in this years draft. However there are three stories I want to touch on, after speaking with Cody Brown (DE/OLB), and his pro-day work out. Cody drastically improved on his 40 time from the combine, running in the 4.5-4.6 ranger, compared to his 4.82 performance at the NFL Combine. Julius Williams (another one of my brothers on the D-Line) comes out of no where, with a verticle jump over 41inches, and benching 225lbs 36 times. That is simply outstanding. For those of you who dont know, Julius Williams has a back that could block out the sun, a true physical specimen, with an outstanding work ethic. And then there is Dahna Deleston. What can I say about Dahna. How about “quiet storm?” in 5 years playing with the guy I probably heard him say about 10 words—total. He weighed in at pro day at 217lbs, ran a sub 4.5 40, and absolutely blew scouts away. It really is a testament to work ethic, and to the character of these young men, all of which flew under the radar of major college recruiting. Great work! Best wishes to all of them in the future.